New Delhi : In a major setback to the prominent public health NGO, Public Health Foundation of India (PHFI), the Union Home Ministry has cancelled its registration under the Foreign Contribution (Regulation) Act, alleging violations of the law, preventing it from taking any further foreign contributions and donations. With the move. 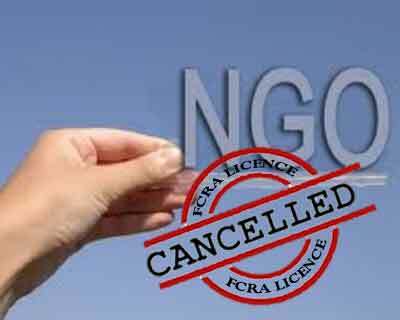 the government has barred an NGO from receiving foreign funding including from Bill and Melinda Gates Foundation. As per the government rules, an organisation that intends to receive foreign funds has to register under the Foreign Contribution Regulation Act. PHFI’s licence was renewed for five years in August 2016, said officials. The action against the PHFI was taken after the ministry found that the NGO was allegedly violating provisions of the FCRA by “diverting” foreign funds for purposes other than intended for, official sources. Indian Express notes the allegations against the NGO include alleged lobbying with parliamentarians and media for the anti-tobacco lobby. It was further alleged that PHFI had opened bank accounts which were not disclosed to the ministry and had “misreported” foreign donations received over the past three years. Officials claimed the NGO had transferred significant sums outside India without alerting the Home Ministry. In a statement, the PHFI said it has received notification from the Ministry of Home Affairs regarding the renewal of its FCRA registration. Certain observations have been made by the Ministry on utilisation of funds related to PHFIs projects on tobacco, HIV/AIDS and its financial reports, it said. “PHFI has submitted the requisite information and documents to the MHA on the observations raised in the notification and provided the needed clarifications. “PHFI is seeking an early resolution of the issue and continuation of the FCRA registration, based on the clarifications provided,” the NGO said. PHFI and its institutions are committed towards strengthening Indias public health institutional and systems capability and provide the knowledge needed to achieve better health outcomes for all, it said. The NGO provides technical assistance to central and state governments in several areas of engagement including HIV prevention, access to drugs, tobacco control, immunisation, environmental health, universal health coverage, public health cadre development and capacity building of primary care physicians. “All of these are in consonance with the objectives of the National Health Policy and serve public interest. Many of these activities were in partnership with the Ministry of Health and Family Welfare. “PHFI would like to assure its partners and stakeholders that it will continue to focus its efforts on working towards a healthier India,” the statement said. PHFI chief K Srinath Reddy told PTI today the NGO has got in touch with the ministry on the issue with a request for early resolution of the matter. “We have submitted all relevant documents and information to the ministry and are now waiting for a response,” he said. The PHFI claims it is a non-profit, public-private initiative working in the field of public health in India. According to the PHFI website, the NGO was launched by the then Prime Minister Manmohan Singh in 2006. It claimed that the Union Ministry of Health and Family Welfare is a founder member and supporter of the PHFI and enabled its creation.The NGO claimed that the governments of Gujarat, Telangana, Odisha, Meghalaya, Karnataka and Delhi are its supporters, besides Bill & Melinda Gates Foundation and other such bodies. According to the PHFI website, they include Infosys Foundation, HT Parekh Foundation, HCL Corporation, Rohini Nilekani, Reliance Industries, GMR Projects Pvt. Ltd. The PHFI website states that the chairman of the executive committee of its governing body is Infosys founder N R Narayana Murthy and members include former deputy chairman of planning commission Montek Singh Ahluwalia.